Ambitious stuff and you have to applaud a club who aims are so bold AND public. The club also make a few bold statements on their website including the claim the serve “the best burgers in English football” and the fact they have one of the best clubhouses in the Non-leagues. The club has gone through some ups and downs just like most in the non-leagues, with threats of homelessness, balanced with some good times in the last couple of decades. They played in the Conference South in 2004/05 and 2005/06 before they were relegated back to the Isthmian Premier League where they have been ever since, although in May 2009 they came close to promotion when thanks to the ridiculous 39 league goals by Richard Jolly they reached the play offs, beating Tonbridge Angels 3-2 setting up a final with Staines Town. However, it was the club from Middlesex that won 1-0 in extra time. Last season was a struggle against relegation for too long after the departure of prolific scorer Jolly. However, the new season has brought new optimism for the club and its fans with manager Mark Butler assembling a squad to challenge for promotion. After a handful of games those hopes weren’t yet evident as the Robins had only four points, the same as visitors Tonbridge Angels. To make matters worse, local rivals Sutton United sat top of the league with 13 points from 5 games. So was the club as good as its word? Would they excite my football taste buds as well? Carshalton Athletic 3 Tonbridge Angels 2 – The War Memorial Sports Ground – Tuesday 7th September 2010 When was the last time you saw a really really good game of football? Well if you were one of the 227 fans in the ground with me you would be raising your hand quicker than a child needing a pee in infants class. This was a cracker – It had five goals, including a last minute winner; it had a controversial sending off; it had a great penalty save; it had referee baiting from the managers; it had a dog…..Yep for the first time EVER I saw someone with a dog in the ground who bounded up and down the touchline whenever the ball came that way. And yes, the club house, with its pool table, three (THREE) dart boards and big screen TV’s was certainly up there with the best. And the burger – well that will have to be for you to find out…. The ground is a real mixture of styles. Enter the ground and look to your right and you will see a huge (for non-league standards) covered terrace that runs the length of the pitch which looks like it was transported from Leeds Road in Huddersfield, or the old North Bank at Upton Park. Opposite this is a newish main stand that covers about a third of the pitch. Next to it is the club house, and its picnic area – tables with umbrellas sat out so you can snack in comfort while you watch. Behind each goal is a covered terrace, simple but effective. So beer in hand I sat back and watched both teams try and play football even with some questionable refereeing from Mr O’Brien who managed to upset both benches. Tonbridge boss Tommy Worrilow was incandescent with rage in the 20th minute when a blatant push off the ball on Liam Harwood resulted in the Tonbridge player exacting revenge with a tackle that he was lucky only to see yellow for. First blood was drawn by Tonbridge when skipper Scott Kinch slammed the ball home from a well worked free kick in the 30th minute. Carshalton responded quickly coming close to an equaliser when their centre forward dragged the ball wide when clean through. It was a bad miss, and the friendly labrador howled in disbelief. I headed into the bar to catch the half time highlights from Basel where the rain didn’t make me jealous at all of Dagenham Dan five hundred miles from home. As luck would have it just as I stepped over the threshold at the bar Carshalton equalised. I could lie and say it was a great team goal but I haven’t the foggiest. Sorry. The second half started with Tonbridge on the front foot. Decent passing, getting the ball wide and trying to play the ball in between the Carshalton centre backs eventually paid off as Sherwin Stanley slotted the ball home in the 56th minute. The Tonbridge fans around me purred with excitement, comparing the new striker to “A Rooney without the prostitutes” which was a bit far fetched I thought. The game turned on one incident with twenty minutes to go. Tonbridge’s Sonny Miles allowed Byron Harrison past him and bearing down on goal, and he took the only option in hauling him down on the edge of the penalty box. Referee O’Brien had no option but to brandish a red, leaving Miles to try and work out how to get into the cage like tunnel on the edge of the box, much to the home fans amusement. Up stepped Harrison but Lee Worgan made a great save. Tonbridge put their backs to the wall and tried to hang onto their lead but it was not to be. Seven minutes to go and Paul Johnson took the ball towards the Tonbridge goal and unleashed a shot and a half that flew into the net to level the scores. Four minutes later and it was 3-2 to the home team as Harrison made up for his earlier penalty miss with a perfect header to give them the three points. This was one of those games where the 90 minutes just flew past. I worked out I had saved £250 by not going to Basel, spending instead less than £15 on admission and a couple of beers here. Sure I didn’t get to sing “Engerland, Engerland, Engerland” or “No Surrender” but I was a darn site dryer than those fans in Switzerland, and I was home in less than 30 minutes. 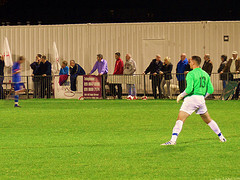 My advice – Monday 27th December….Carshalton Athletic v Sutton United. We will be the ones in the Greyhound from 11am! More photos from the game can be found in our Flickr feed here. About the War Memorial Sports Ground One of the best grounds in the Rymans League at the moment, the War Memorial Sports Ground started life as plain old Shorts Farm back in the 1920’s. The first part to be developed was the grandstand, originally bought and transported piece by piece from Epsom Racecourse down the road. In 1968 galeforce winds battered this stand so much that it had to be demolished. Today the main feature is the huge covere terrace that runs down the side of the pitch, allowing ample room and some excellent views for thousands of fans. Today the ground boasts a good sized if small in length grandstand and plenty of standing room down the side of the pitch. Behind the north end is a small cover whilst at the south end the cover extends across the full length of the terrace. The club claim to serve the “Best Burger in English Football” from the new eatery in the corner of the pitch, next door to the club shop, both allowing you to watch the action whilst waiting to be served. 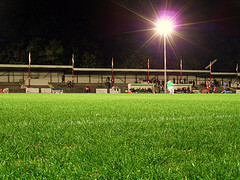 The club have unsuccessfully tried to continue with the redevelopment of the ground, including a planned £12m facelift which was rejected by the local residents association. However, today the ground is certainly fit for purpose with the new club house providing a valuable 7 day a week income stream for the club. How to get to the War Memorial Sports Ground Carshalton is not the easiest place to get to from anywhere else apart from South London by car especially if you have to travel through Croydon which can be blocked by shoppers on a Saturday, and commuters in midweek. However, if you do want to drive then you need to head for the A23 Purley Way. If you are coming from the north then follow this past Ikea (on your rght) from Purley Cross and then take a right onto the A232 after a mile or so. If you are coming from the south via the M25 then take exit 7 signposted Croydon and follow the A23 past the old Croydon airport before taking a left after a few miles onto the A232. Follow this road for a couple of miles, passing Beddington Park on your right before you enter Carshalton. Pass through the High Street, passing the two large ponds on your right and take the next right into West Street. Pass the Racecourse and Hope pubs on this road and then immediately after you pass under the railway bridge take a left into Colston Avenue. The entrance to the ground is down a small alley about 150 yards on your right. This is a busy and narrow road so I would avoid parking down here – there is a car park at the ground (£2) or park on West Street. If you are coming by train, Carshalton is served by Southern Railways from London Victoria, Dorking or Sutton and First Capital Connect from London Blackfriars and Wimbledon. Journey time from Victoria is just under half an hour and costs £4.40. Carshalton is in transport zone 5. The ground is only a few minutes walk from the station – take a right out of the exit and walk down the hill. Turn right, walk under railway bridge and then left into Colston Avenue – ground is 150 yards on your right. Last train back on a midweek night to London is 23:26 – plenty of time for a beer or two in the clubhouse. Bus S3 also runs down Colston Avenue. Admission into the War Memorial Sports Ground It is £9 for Adults and £6 for senior citizens to enter the ground, and amazingly FREE for under 16’s as long as they are accompanied by an adult. Programmes are on sale at the turnstiles and cost £2.